Getting the correct size in jig shoes and pumps can be difficult, especially if you are moving between styles. 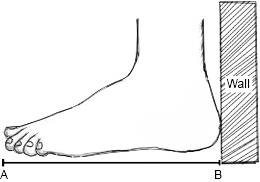 If you are unsure what size to purchase then measuring your foot can be a useful indicator of what size to go for. Here are our top tips for creating an accurate measurement. 1. Place a clear piece of A4 paper up against a wall so that the edge of the paper touches the wall. 2. Put on the socks you normally wear when dancing and place your foot on the paper and put your heel up against the wall. (Double check that the paper is still touching the wall once you have put your foot on it just incase it has moved). 4. Now take the paper and draw a straight line to the longest point and measure with a ruler. 5. This is the measurement you will need to work out what size to order. 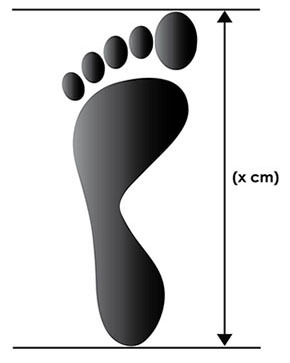 Make sure to measure both your feet as they often have slightly different measurements - use the largest measurement when choosing your size! Please note that while this method is a good way of assessing the correct size, we cannot guarantee that this method will deliver the correct size in 100% of cases. Click here to find out why using the sizing chart cannot guarantee the perfect fit. We cannot accept liability for return postage in the event where this sizing method is used and the size is incorrect.